BELGRADE, Yugoslavia (CNN) -- Yugoslav President ordered the release of three captured American soldiers on Saturday as NATO air crews saw their busiest day of attacks on Yugoslavia since the conflict began. The U.S. prisoners are to be released to the Rev. 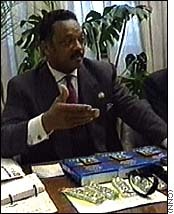 Jesse Jackson and his team of interfaith American peace advocates Sunday morning. Then, they will travel six hours by road from Belgrade to the Croatian border, officials in Belgrade told CNN. "This is a gesture of good will," Yugoslav Foreign Ministry spokesman Nebojsa Vujovic told CNN. "We want to engage in a political dialogue." Jackson and his colleagues went on a private mission to Belgrade two days ago to plead for the soldiers' release. The visit was not officially endorsed by the United States. 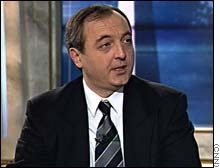 But he will return to the United States with a letter from Milosevic to U.S. President Bill Clinton, outlining Milosevic's views on ending the conflict, Vujovic said. 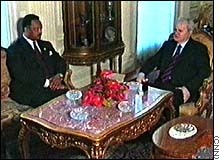 Jackson said the letter also expresses Milosevic's desire to meet with Clinton in an effort to resolve the crisis. He and his colleagues hugged each other and jumped up and down when they heard the news. Jackson also made a veiled suggestion to NATO to do something in return for the soldiers' release. "It is a gesture that shouldn't go ignored," he said. Jackson met with the three soldiers -- Staff Sgt. Christopher Stone of Smiths Creek, Michigan; Staff Sgt. Andrew Ramirez, 24, of Los Angeles; and Spc. Steven Gonzales, 22, of Huntsville, Texas -- individually and as a group Friday. 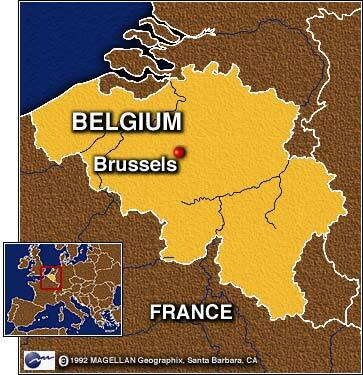 Once released, the soldiers will likely fly from there to the nearest U.S. air base, probably in Germany. They were seized March 31 during a routine patrol along the Yugoslav-Macedonian border. They were supporting a NATO force deployed there in case a peace deal enables them to enter Kosovo to serve as peacekeepers. Also Saturday, a sweeping U.S. trade embargo against Serbia went into effect. The embargo, which Clinton ordered Friday night, is designed to cut off oil supplies to Milosevic's forces. Clinton's action came in addition to sanctions already in place barring the sale of arms to Serbia and restricting financial transactions. In a statement, the president said Yugoslavia's second republic, Montenegro, would be exempted and that the sanctions would be applied "with consideration for the humanitarian needs of displaced people in Kosovo and other civilians." "As we continue to intensify the air campaign, this is another step in tightening the noose around Milosevic's war machine," said National Security Council spokesman David Leavy. "The United States will continue to tighten the screws until our objectives are met." Clinton approved the embargo as NATO continued its fight to halt a reported campaign of persecution of ethnic Albanians in the Serbian province of Kosovo. The European Union is considering a similar embargo. A number of key bridges, radio transmission towers and control buildings, petroleum plants and other targets were hit Saturday, said NATO spokesman Peter Daniel. But NATO spokesmen said they knew nothing about a report that a stray missile struck a civilian bus on a bridge in Luzane, north of Kosovo's capital, Pristina, killing at least 23 people. "I don't have any evidence of this accident," said Col. Konrad Freytag, NATO's military spokesman. Yugoslavia's Tanjug news agency said the missile cut the vehicle in two, sending part of it plunging off the bridge, which was damaged but not destroyed. CNN has no independent confirmation of the bus being hit. The 38th day of the Yugoslav conflict was the most active to date, Pentagon spokesman Ken Bacon told reporters. More than 70 targets were bombed, U.S. Air Force Maj. Gen. Charles Wald added. "Yesterday we went after the nervous system that keeps the Milosevic machine informed and in touch. NATO forces pounded transmission towers and control buildings of the Yugoslav radio relay network in seven different locations," Daniel told reporters at NATO headquarters in Brussels, Belgium. "In the same period, we attacked seven bridges that provide key lines of communication between the Serb forces in the field in Kosovo and the rest of the Yugoslav military," he said. Also hit during the approximately 600 sorties were military airfields, armored personnel carriers and other military vehicles, Freytag said. 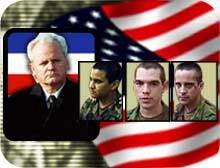 "Every day Milosevic is less able to stay in touch with his forces and keep them supplied," Daniel said. "Every day the Belgrade regime is more isolated from the world." Correspondent Chris Black contributed to this report.